October is “Adopt-a-Pet” month. 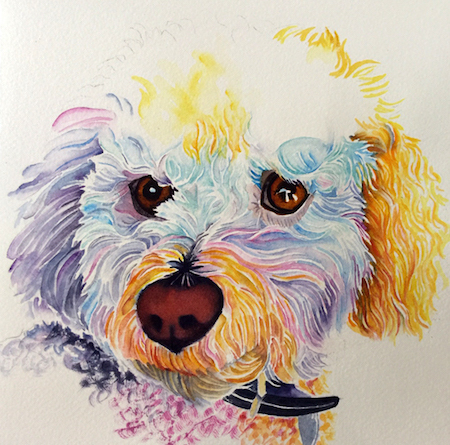 It’s the perfect time to order an original watercolor Pet Portrait. 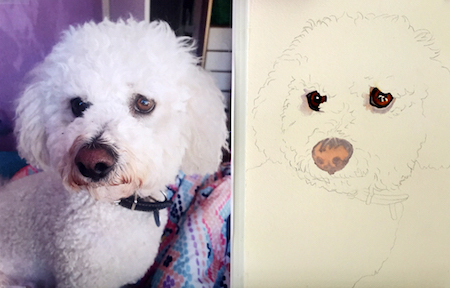 Today I’m sharing one of my recent Hawaiian-style Pet Portraits. They're also available in the true colors of your pet. I live in an apartment that doesn’t allow pets, but Keanu and I both love animals. About two years ago, we heard a tiny mew coming from a drainage ditch behind our house. I like to start the portraits by painting the eyes, nose, and mouth. If I can get that right, the rest is sure to follow suit. Alas, we found the kitten too late to save him, but we caught and spayed his mom. “Mommie Cat” remains our feral cat today. I suspect she once belonged to a student in the neighborhood who either couldn’t find her when it was time to move or couldn’t take her along. Mommie doesn’t want us to touch her, but she expects, and receives, food and water whenever she asks. “Mommie” has a boyfriend, “Tom," who’s part of the package deal. We haven’t been able to capture him, but I suspect his “tom-catting days” are numbered. He’s a beautiful, but a scrawny specimen of a once handsome cat. Our pets carry within them seeds of love and sprinkle them freely on our days. It’s been said that domesticated dogs, unlike wolves from whom they’re descended, remain puppies their whole lives. They never fully mature into full-grown, “I can take care of myself” animals. The play behavior exhibited by all baby animals turns into much-needed survival skills by wild animals. Our pets rely on us for their care, allowing them to remain young at heart. Our pets keep us young at heart with the ever-present love they convey in a myriad of ways. “Puppy-dog” eyes are eyes filled with love — and sometimes a question. When we respond with approval, a “smile” engulfs the entire countenance of our pet. The love our pets bestow upon us and stir within us, far outweighs the cost of food, shelter, and medical attention we provide. If you’re able, go to your nearest pet shelter and take a new pet/friend home with you. Or volunteer your time to walk a dog, or foster some tiny kittens or puppies too young to be adopted. ONCE you find the “love-of-your-life-pet” remember that when you order one of my pet portraits, whether a realistic one or Hawaiian-style one, $25 goes directly to the Humane Society.